Wally Shoup is here again, but the line-up is different: Paul Flaherty on tenor and alto sax, Thurston Moore (of Sonic Youth fame) on guitar, Chris Corsano on drums. As Dan Warburton writes: "It is only just that this magnificent work should find itself on the venerable Leo label, and I for one can't wait to hear more of it, especially now that the likes of Matt Shipp, William Parker and David Ware are sliding progressively back towards orthodoxy... It's good to know there's still somebody on the edge willing to come back and remind us what it's like out there." 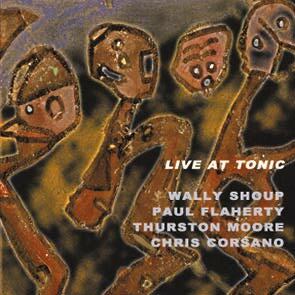 Recorded live at Tonic, New York, to the ecstatic reception of the crowd. Duration: 73'05.